I Love You More Than Carrots: It's An Incredible Thing, To Be Missed. "I missed you so much, Mom," he says when I pick him up from Pre-School two days a week. It's quickly followed by a, "Just sometimes I missed you though. Not all the times," but nonetheless I am quickly turned to mush in his little hands. It's an incredible thing to be missed. As a stay at home mom, it's not very often that we're privy to that sort of feeling. As a matter of fact I could count on one and a half hands the number of times I've had to leave my boys for an extended period of time. It's healthy for the both of us, I know this, but it doesn't make the leaving any easier. Picking Carter up from Pre-School has become one of my favorite moments each week. I look forward to pick-up roughly the same way that he looks forward to attending school. Wednesdays through Sundays are tricky though. You try explaining to a three year old that he only goes to school on Mondays and Tuesdays. It's like trying to explain to him that I do more than just "laun-dah-ry" while he's away. That's what he always asks me upon pick up, "Mom, did you do all of my laun-dah-ry while I was in the school?" Of course I answer yes. Yes, I did. All of it while I was missing you. It's a little lie that couldn't be further from the truth. I love asking him about his day and I'm grateful for the cheat sheet of songs and activities that hangs outside his classroom door. If it wasn't for this sheet, I'm fairly certain that while he's at school, he does nothing more than "play trains" and "paint sometimes." As the days progress, it's become extra fun learning about his new friends. His classmates don't have names currently, unless you count "Dragon," who I'm pretty sure is really named "Jackson." I will say though, if his parents really did name him Dragon, I would love to shake their hands. Right now he plays a lot with "the boy with the yellow hair," mostly trains, of course, and there is a "girl with red glasses on her head" that always wants to hug him even though he's "tired of hugs." On or around his fifth day of class, his teacher approached me and very seriously asked if I had ever had his hearing checked. I was a bit taken a back but the truth was, he had had his hearing checked six months earlier and passed with flying colors. She went on to say that whenever he is playing, he doesn't typically look up when she calls his name to move onto the next activity. I laughed. I explained to her that his hearing is fine and that's just our Carter. He loves playing so much that it's easy for him to tune out what's going on around him. Not to mention that this is the first time he's ever had to answer to anyone other than me and I'm sure that will take some getting used to. She seemed satisfied with my answer but that didn't keep me from calling my mom as soon as I got into the car. "Mom! She thinks he needs his ears checked! He's not listening to her! I have that child in class! You know, that one!" She quickly reminded me that he's three and to stop worrying. He's a boy, he loves to play and it's great that he can play with that kind of concentration. Thank god for moms. Even with three years of experience under my belt I have a feeling that it's going to be many, many more years of phone calls to my own mother. Sunday evenings are my favorite. As I tuck Carter into bed at night, I start talking with him about the exciting days of school that he has ahead of him. How he'll get to see his teacher and all of his friends again. To see his eyes light up and his voice lift higher and higher with excitement as he talks about his favorite trains and his favorite easel full of red paint. He doesn't know this yet, but I am equally as excited as he is. However, I just can't wait to be missed. This just warms my heart. All of it. I am the worker-bee in the family while my husband is the stay-at-home dad and when I get home from work, I'm a giant, gooey mess of a Momma when I'm greeted with a bear hug, kisses and "miss you so much!" They sure know how to work it, don't they? I love the recap of school. Dragon is basically my favorite version of a name, haha. So sweet! Aww reading this made me tear up-thinking about when my little guy will leave me for a few days a week! I already miss him so much when he goes to bed for the night!! Pathetic! The "even when he is tired of hugs" line cracked me up! It's so good to hear that school is going well for both of you - although in different ways. How does Mac'ster do without big brother around? I am always in a catch 22 with this. I love sending the kids off to school because it allows me to get some much needed work done. But, then, I immediately count down the hours/minutes until they get back home because I miss them so much. Bless. This is so sweet! God love his little heart! I'm so glad that he's LOVING it the way that he is. What a wonderful feeling for momma to be missed too! I'm proud of y'all! And as for the hearing...Easton's teacher asked me the same thing 2 weeks ago. I'm 100% certain that he can hear...but chooses not to listen at times. I am going to have it checked, but I'm with your mom...he's a boy...he's 3...he can tune out a lot...kinda like his father! ;) Don't stress girl! He's a good egg! Oh, to be missed. After my long trip to California last week, I felt refreshed thanks to some "me" time alone in the hotel. But that gets old -- fast. Each time I called Rhys he asked if I was on my way back home. I loved hearing his little voice on the phone but it made me ache to be home with him. It was the sweetest feeling when I went into his room the first morning I was back and he exclaimed, "Mommy, I'm so happy you're home!" Tommy has been in daycare since 4 months, and now preschool at the same daycare, and as he's gotten older, every day I look more and more forward to picking him up. He usually greets me with a huge "Mommy!" yell and smile, and runs at me, nearly knocking me over. However, once in a while, I'm dragging him kicking and screaming, because he does not want to leave his friends - all depends on who is still there, since I'm usually one of the later picker uppers! We are at the point, however, where Tommy does not want to go to school some days, and I have to fight the getting dressed part, explaining that he does not want to miss pizza day, or whatever fun thing might be going on. Or I resort to saying, "only 4 more days and then we have a "home" day!" - meaning Saturday! Glad to hear that Carter has adjusted and you as well; it's still difficult for me to drop off every morning and I've been doing it every day for over 3 1/2 years. And I have been sad the last few days as he has opted to play with his friends rather than wave out the window to me as I get in my car. But it's all part of the growing up, I know! Oh hun, MY son was THAT kid and it was way worse than not listening. It was bad. I mean, cry in the car after you drop him off because when he walked into the classroom the other kids would say "Ugh! Logan is here!" and "Logan, could you please TRY to be good today?" Bad, as in "on a first name basis with his principal" bad. Yeah. But this year, in first grade, it's all turned around. Things are going so well that we got to skip the fall parent/teacher conferences because our kid is straight up awesome. Some things we had to learn to manage and others he just outgrew. Oh, and there is a kid named Sixto in Logan's class this year. Makes me think Dragon might be a real possibility. I'm glad Carter is adjusting so well though and really likes it. I'm not sure Vivienne will feel the same next year. Isn't it bittersweet to drop off your kids? I leave E with grandparents multiple times a week while I workout and run errands, her squeals and smile when I pick her up just makes my day. E's been going to "school" forever and I STILL love picking her up everyday. It never gets old to see her eyes light up and her run to me. they are the sweetest of sweet! I love that photo! 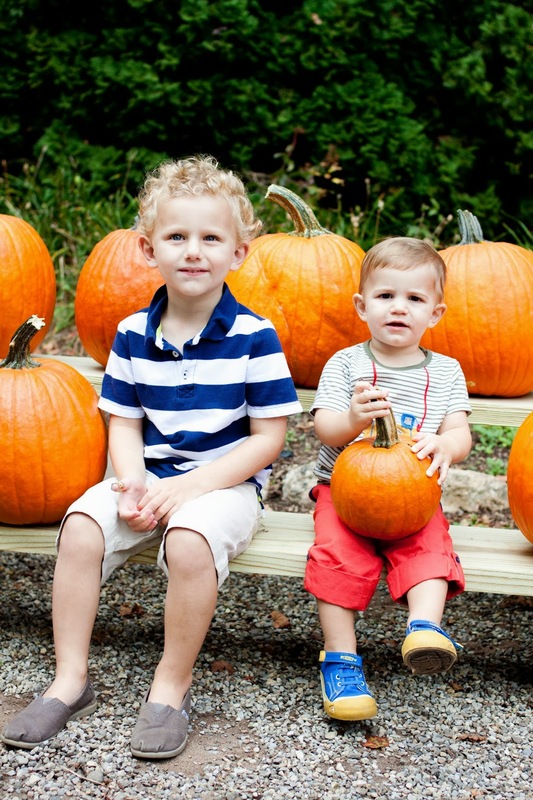 Pumpkin patch/apple picking/fall fun photos are the best! So glad he misses you and that you get a short break now and then!! 1 on 1 time w/ Mac must be great too. McKayla is in the 6th grade and I just can't wait to get in that car line and pick her up! I love to hear about her day and she still says she missed me. I love this post, AP! Great photos, too! Daycare pick up makes me feel like a rock star every-dang-day. No better sight than seeing his little face light up when I walk through the door. I also majorly love the "Mama!" and big hug around my legs. It's nice to be missed. What fun - I love the massive hugs I get when I pick the kids up from school. The best ever. On another note - have you ever had his ears checked by an audiologist? Both my kids had fine looking ears to our doctor, but when we had them brought into an audiologist, it turned out they had a drastic hearing reduction (over 40%) due to fluid. It was like we were talking to them underwater. Once tubes were put in their ears, they were fine and could hear 100% of the time. It was a miracle how much more they listened. And, it turned out my son had polyps growing on his eardrum - something we never would have known unless we went the tube route and he had the surgery to get them in... Just some food for thought. But, as his mother, you definitely know your child best.